The Guinness Book of World Records says that « the greatest unsolved robbery » was the disappearance of the entire German treasury at the end of the war. Deutschkatharinenberg (GERMANY) – An expedition is organized, slowly and secretly, to lay hands on a set of paintings and art objects supposedly hidden by the Nazis. The Hatvany collection could well be found. A radar sensor has since proven the existence of a secret room, fifty meters underground in old mine workings of the Ore Mountains, a chain of cobalt and silver between the Czech Republic of Germany. An expedition is about to be launched in June to unravel the mystery. Art historians have been excited for this search. The collection of Baron Ferenc Hatvany rich Hungarian industrial looted by the Nazis for his Jewish origins, is indeed famous. This is to maintain freedom that the collector handed, forced to Adolf Eichmann. If a party has been found after the war, paintings by Monet, Manet and Cézanne, sculptures and precious tapestries have not been revised since cataloged works, all of which is now estimated at more than one billion euros, could be in the mine. Protected from contacts outside the stable environment of the mine lets hope a good state of preservation. At their peak in 1949, the United States holds half of all the gold ever mined in history, almost 22,000 tons. While the world is difficult to extirpate the Great Depression, a new crisis is making great strides. It threatens the entire civilization. Adolf Hitler came to power when Germany was still shaky from its defeat in the First World War. Its gold reserves are empty and worthless currency. Having promised to return the country to its original glory, Hitler began to rebuild the German Empire. To do this, he needs gold. It is essential to understand that the gold reserves of Germany in 1939 are not huge, about 200 million and they were already heavily engaged in particular in the construction of the German war machine. Moreover, the country can not afford to buy manufactured goods abroad or basic raw materials with its weak Reichsmark. His only alternative is gold. Also, as and when she walks in Europe, the German army plundered the way the gold reserves of nations. In 1938, Czechoslovakia with its $ 30 million in gold, Poland in 1939 with $ 85 million in gold. In fact, it started in 1938 with the Anschluss in Austria. They first took the gold of the Austrians, and in 1939 they took over the Czech reserves finishing occupy Czechoslovakia, and the beginning of the war, whenever they had mastered a country , they looted gold. Most of Hitler’s loot is stored in the vaults of the Reichsbank in Berlin. But the tide was turning for the Reich that will last a thousand years. Intensive day and night bombings by Allied forces systematically destroy Hitler’s war machine by hitting the heart, that is to say by destroying industrial infrastructure itself built on the stolen gold. February 3, 1945 more than 900 bombers unleash nearly 2,300 tons of bombs on Berlin. The city is reduced to the state of ashes and ruins, the Reichsbank was virtually destroyed. In February 1945, what remained of the gold reserves at the Reichsbank was probably loaded onto trucks by prisoners, probably French, and transported to Merkers south of Germany. This spring 1945, the Third Army of General Patton ahead of Germany as a juggernaut. On April 4, it enters the city of Merkers. Rumors are circulating about a secret cargo recently arrived in Berlin and was hidden close by, in a potassium mine. Out of curiosity, several GI decided to go investigate. Upon leaving the elevator, eight hundred feet below, they come face to face with a huge steel door. It sends a message to Patton, what should we do? Patton’s response: « saute the door. » The genius was about to blow the door, someone has made a half-stick of dynamite enough to blow up the wall right next to it without having to worry for the vault. 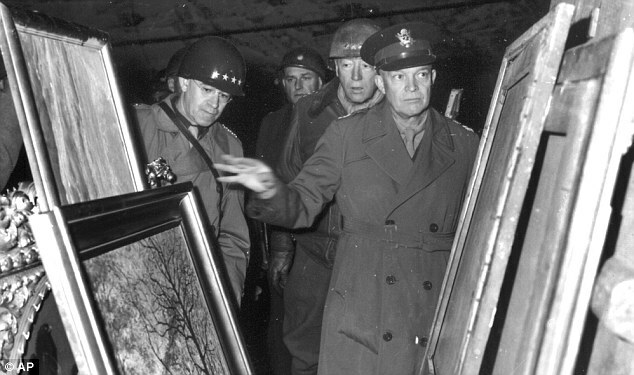 General Bradley, Patton and Eisenhower at the incredible discovery. In the rest room more than 7,000 bags neatly stacked. What Americans are inside is so amazing that three of the most powerful men in the world want to see with their own eyes. George Patton, Bradley and his superior Eisenhower, Supreme Allied Commander in Europe. The cream has moved to a scene out of the ordinary. More than 8,000 bars of gold ingots, 2,000 bags of gold coins: Reichsmarks, the English sovereigns, napoleons, U.S. dollar coins 20 gold and hundreds of bags of gold coins coming from other countries. Advancing towards the bottom of the mine, Patton discovered the cache of a sinister booty. While the back of the room consisted of property that had been stolen from victims of the concentration camps. There was a stack of suitcases filled with silverware, alliances, gold teeth. Each bag, box or trunk had been carefully cataloged and stamped with a label marked Melmer. Melmer was a German SS officer who did the back and forth with the concentration camps to pick up everything he could as gold teeth, wedding rings, gold watches to the route to Berlin. During the war, he had been like that at least 77 shipments containing the fruits of his plunder. This kind of ingot is found more commonly in Argentina in safes. Assets brought to account Melmer then figure more than one million U.S. dollars. Today this amount exceeds the billion, but this discovery is still only the visible part of the iceberg. At the end of the war, the Germans looted for about $ 580 million in gold through the occupied countries. Thereupon, an estimated value of $ 450 million in gold during the war transferred to Switzerland and to other countries. In 1946, he was given the gold to an international commission to quantify the damage to victims of the Holocaust. The surplus is given to an Allied Commission that redistributes the stolen nations. Europe is devastated and falls painfully the Second World War. The United States appear as the richest country in history. To rebuild their economy, war-torn nations are forced to buy dollars. Their payment is gold. As a result, the gold reserves of the United States are soaring. The biggest share is stored in five levels in Manhattan vaults of the Federal Reserve. At the time, there was in the basement of Manhattan probably about a quarter or a third of all the gold mined in the mines. Relying on such a quantity of gold, the dollar is the strongest currency in the world during this period. Countries settle their debts in dollars and governments can exchange their dollars for gold. The power transfer is made from Nazi Germany to the United States of America, but we are in 2013 and the Chinese Communists, became more capitalist than capitalism itself quietly take over. 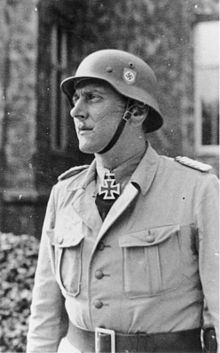 To understand how much wealth and gold came out of Germany since 1945, it is to follow the route of the ace elite SS commando Otto Skorzeny. It was long believed that the express request of the Führer, he multiplied missions behind enemy lines. The most spectacular of them, the Greif operation was to create a group of American soldiers forged in order to sow confusion in the rear lines of the Allies during the Battle of the Bulge in December 1944, and operating one of the first false flag attacks of the war. it is even feared that he Att to assassinate the Commander of the Allied forces in Europe, U.S. General Eisenhower. Otto Skorzeny was related to the concentration camp at Oranienburg Sachsenhausen according to the testimony of French deportees who appear in the book Sachso, book published by the friendly Sachsenhausen in 1982 Edition human Earth. Towards the end of the war, he participated in the creation of Die Spinne (Spider), responsible for ensuring the good old SS flight to Italy. At the end of the war, it is Obersturmbannführer and for his exploits, decorated with oak leaves German. At the German surrender in 1945, he was imprisoned for his Nazi activities, but was acquitted of the charges against him. Use the uniforms of enemy soldiers is an act forbidden by various treaties of war, but he was pardoned as an English officer Forest Yeo-Thomas confirmed on the final day of the trial of Otto Skorzeny, the British had also previously used this method to infiltrate prisons in France, to deliver some of them. After the war, Skorzeny fled to Franco’s Spain. He became head of treasury Nazi war without Hitler’s knowledge made by Martin Bormann in 1944. His own organization, Bruderschaft (the « Brotherhood »), turns into ODESSA (« Organization of the former SS members », an organization that was responsible for managing the funds recovered by the former SS and permits and provide materially their future life). 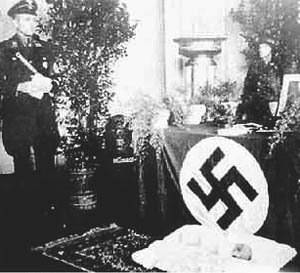 In 1953, Skorzeny was sent by former General Reinhard Gehlen in Egypt as military adviser General Mohammed Naguib. With General Wilhelm Fahrmbacher and several former Nazis such Oskar Munzel, former general Panzer Division, Leopold Gleim, former head of the bodyguard of Hitler, Joachim Daemling, former head of the Gestapo in Dusseldorf and Dr. Hans Eisele camp Buchenwald, he structure of the military and police forces in the country, resulting in the first Palestinian commandos. In 1963, the Mossad learned that one of his former subordinates, H.Mann is responsible for the safety of German scientists working for Egypt in the development of non-conventional weapons. Mossad tries to recruit Skorzeny, who accepts in exchange for a commitment from the Israelis not to seek to remove later. Thanks to him, the Mossad harvest important information on the structure and the scientific program of Egyptian research. The failure of one will lead to the end of its collaboration with hébreu910 State. In 1970, he created with Gerhard von Hartmut Schubert organization of anti-Franco struggle based in Spain, which carries out attacks and recruiting mercenaries Paladin group. He also indulged in arms trafficking, through his company Atlantico, located in Franco’s Spain. 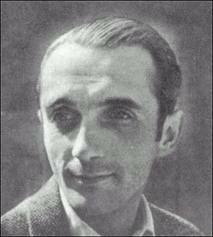 He died July 6, 1975 of cancer in Madrid. He married Ilse von Finkenstein second marriage. This is Martin Bormann had organized the transfer to Argentina at the end of the war. Indeed, some authors asserted that the treasure had been stolen by the Germans Peron couple who had welcomed with open many war criminals arm. The author has stepped into the breach by imagining that the treasure was hidden in the tomb of Eva Perón. Others believe that Bormann had survived as Soviet spy and he continued to advise the Soviets after the war. Many controversies remain about the death of Bormann. Indeed, some question the analyzes of the teeth of the skeleton and DNA analysis. Personalities as the son of Adolf Eichmann or Simon Wiesenthal (the latter in the final chapter of The Murderers Among Us, published in 1967) claimed that he was alive in South America, particularly in Paraguay. 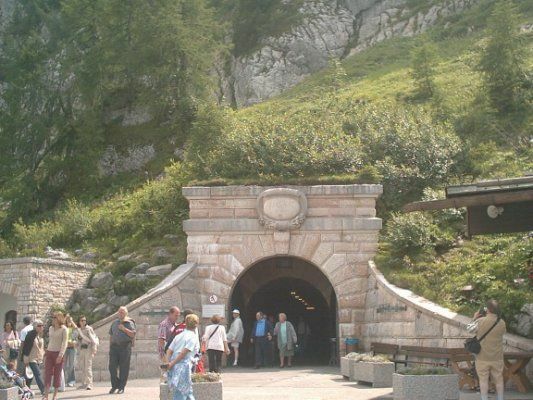 It is a museum dedicated to the counterfeit money found part of the money made ​​by the services of SS. Part of the German war chest will be manufactured by the German themselves are counterfeits made by false Jewish coin « engaged » by the SS. The Operation Bernhard is the name of the German project to destabilize the British economy during the second world war by flooding the country of fake banknotes of £ 5, £ 10, £ 20 and £ 50. The project started in 1942, led by SS Major Bernhard Krüger rising a team of 142 counterfeiters selected from prisoners of Sachsenhausen. The first job is to write detailed plates reproducing the pattern of the ticket, and then make the watermarked paper and finally crack the code for generating the authentic serial numbers. Tickets and made part of the finest ever fake products, it is very difficult to distinguish true. The initial plan to drop these counterfeits by air over England can not be put into practice and the tickets are used for the purchase of goods or to pay German agents as famous Elyesa Bazna (Cicero) that had managed to photograph documents on the landing. These counterfeits are detected by the Bank of England, when an employee noticed in its records that the same serial number had been used on two different tickets. Total is 8,965,080 counterfeits that were made for a total of £ 134,610,810. 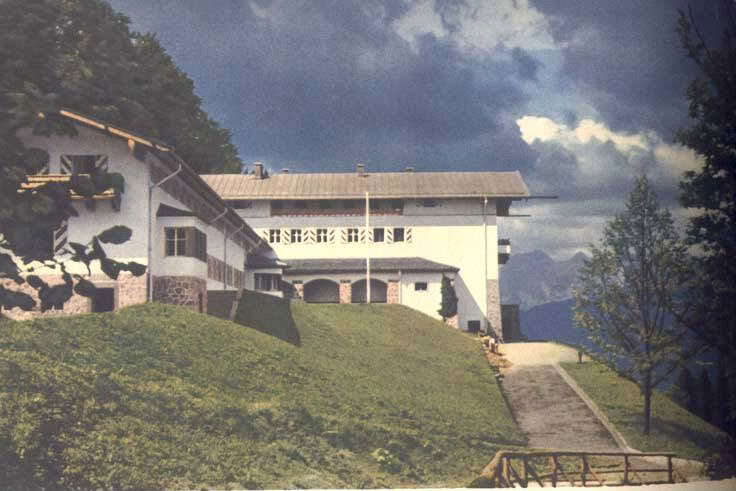 After the evacuation of Sachsenhausen camp in April 1945, the team of counterfeiters is transferred to Redl-Zipf in Austria, an annex of the Mauthausen camp, then in Ebensee. In early May 1945 the performance of the team is ordered, but the camp was liberated by U.S. forces on May 5, 1945, provides for their lives. Some tickets were found in 1959 by divers in Lake Toplitz near Ebensee, others continued to circulate in England for years …. It is obvious that the best carrier to evacuate the German treasure was and remains the U-977.Peu matter what the rationalists say, it is the essential link. In the sparkling waters off Mar del Plata, Argentina, the bow of a submarine breaking the surface. 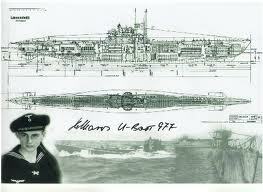 Appears when the U-977, commanded by Captain Heinz Schäffer. He stops as dead in the water until the Argentine cruiser Belgrano docks. Schäffer then is routed to the edge of Belgrano and puts his ship and crew. While Schäffer was a « guest » aboard the Belgrano, the newspaper El Dia in the Uruguayan capital Montevideo ran to the front of the story, claiming that the U-977 had landed first near Comodoro Rivadavia in the south of Argentina. The President of Argentina, Juan Domingo Peron, took the report seriously enough to have actually lead Schäffer in Buenos Aires and the question … personally. Not a single document recognizes the skill and endurance that had happened to make this first long trip in a submarine under such conditions. No, every news story, all reports, feature article and rumors on the same theme stale old gave Heinz Schäffer.Comment reason could he have moved as far as Hitler … without witnesses? Thus, with Heinz Schäffer flesh before them, it was natural that these gentlemen, Peron and Trumann, should be sure of them and almost everything to retrieve information about the Führer, they were so eager to capture him alive despite the fact that he had so long been reported dead. « Otto Wehrmut, commander of U-530, was suddenly brought face to face with me, and then we found ourselves in the same room. We had never met before, but we saw at once that it was all part of a plan. They hoped that in the first wave of our meeting we were happy reunion until we forget ourselves as to discuss in front of all their dictaphones, history of interior an escape and a ghost train. The U-530 sailed to Argentina after completing a dangerous secret mission in the waters near the United States at the beginning of April 1945. It was the will of his commander, Otto Wermuth, to go to Argentina rather than any other of the Allies. Wermuth was not involved in the load operation. 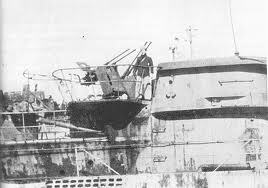 The boat went to Mar del Plata, July 10, 1945. All newspapers, code books, documents, guns, torpedoes and ammunition had been dropped overboard in advance and there was even an attempt to sabotage the diesels. The boat was found in a state inexplicably « corrosive ». So here is the explanation: the submarine U-977 would ALL carried in its hold … even many Führer.De boxes of gold bullion have been landed, if dropped overboard … off Argentina . Continue my research on this and I still have many pages to write.